I'm a 52 year old female and I have no symptoms of menopause. I have pain in my lower back that radiates down both groins when walking or standing for long periods of time. This started 9 months ago. The pain subsides when I sit down. The pain will goes away for weeks and then will return. It has never lasted more than a week as this time. I originally thought it maybe due to my age. I have returned to my chiropractor that I had seen 25 years ago for headaches. I'm going to contact another well recommended Chiropractor. Do you have any idea what could be my problem? Why change from the doctor of old, assuming he helped you with your headaches? He's the tried and trusted one. With groin pain there's always the question whether it's a local hip problem, or a radiation from your back. It's usually fair easy to distinguish. Lie flat on your back and pull each knee to the chest and then towards the opposite shoulder. Now place your foot on the opposite leg and drop your knee down into the lotus position. Do any of these movements feel particularly stiff and painful in the groin or hip? 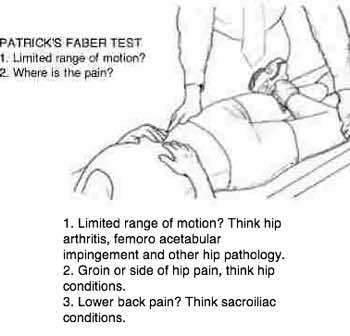 Testing for a referral from your sacroiliac joint, the femoral nerve or a Maigne's syndrome you'll have to leave to your chiropractor. Using the search function at chiropractic help you can find information about these terms. Let me know how you get on. Meantime start some of our gentle hip and lower back exercises every morning before getting out of bed; they take less than two minutes.